In 2015, following high-profile police shootings of civilians, a survey found that 95 percent of large police departments were planning to use them in the future. 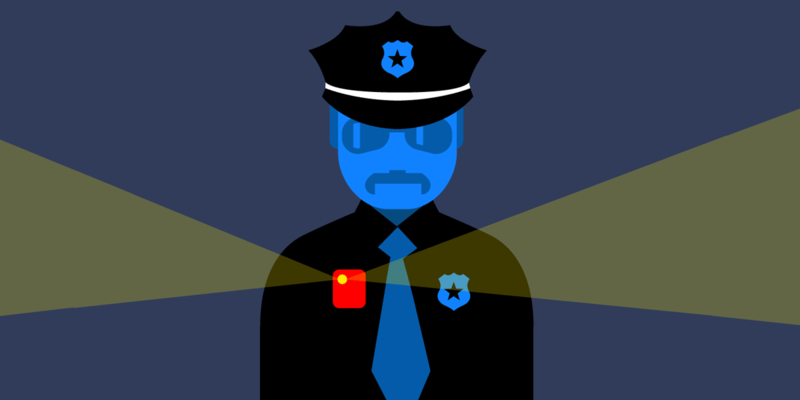 Body-worn cameras can serve a valuable function in increasing police accountability. Without proper policies, though, they can also be use to surveil people who interact with police, or those who may not be aware that filming is taking place. BWCs can’t function as a proper police accountability tool unless the public has a clear right of access to police video and audio recordings. Unfortunately, some of the first departments to embrace the cameras also had inadequate policies that utterly failed to ensure accountability or transparency. When the Los Angeles Police Department announced in 2015 that it would roll out several thousand BWCs for officer use, the department’s policy provided for no public access whatsoever. The department not only allowed, but required officers to review video before writing up their reports. The review took place even before officers provided initial statements to investigators in cases where they were accused of misconduct. The LAPD policy was so poor that we urged the Department of Justice not to fund the city’s BWC experiment. Earlier this year, the LAPD made a major change in its policy, and now California is set to follow suit with A.B. 748. A.B. 748 generally requires public access to video or audio recordings related to a “critical incident,” which is defined as an officer use of force, or a legal or policy violation. Police can withhold recordings related to an active investigation, but only for 45 days. After that time period, the agency must disclose a recording, unless it can prove by clear and convincing evidence that the disclosure would interfere with the investigation. The bill is a good start, but not a complete solution, for police BWC policies. Local agencies can and should go further. A proper policy should also make provisions for preventing BWC recording of public protests and similar First Amendment protected activity; not allow officers to review footage before writing reports; and discipline officers who do not use their cameras to record when they should be. Finally, a BWC policy should apply to all police use of cameras, not just the “critical incidents” defined in A.B. 748. We’re supporting A.B. 748 as a first step in the right direction and hope the California legislature passes it in the coming months. The proposed law will serve as a critical “floor” for public access to police recordings, and prevent the kind of no-disclosure policies that were, until recently, used in Los Angeles.